The Sarnia Streets Project is now available in book form. The Project, a 340-page compendium of original research, tells the story behind the name of virtually every street, boulevard, crescent and cul-de-sac in the city. But until this week it was available only online. “We’ve had people ask us where they could get a copy, and now City Hall is doing this as a community service gesture,” said Randy Evans, who co-authored the volume with fellow “road scholar” Tom St. Amand. To tell the story, the pair spent thousands of hours over four years scouring land registry records and old issues of The Observer, as well as genealogies and census data. Their most important source, however, proved to be the residents of Sarnia themselves— more than 550 of them — who shared facts and tips and family stories and invited them into their homes. The volunteer effort was a labour of love. Not a cent has been made from it by anyone, and City Hall is printing the book at cost. But the experience itself has given the two researchers a rich insight into the community and the residents who make it tick, St. Amand said. “People here are really proud of this city and they wanted to help — even people who used to live here and now live in other places,” he said. Evans said he hopes going forward City Hall will make it easier to keep the history up to date. All it would take is a requirement for developers to include in their application an explanation for the streets they name, he said. 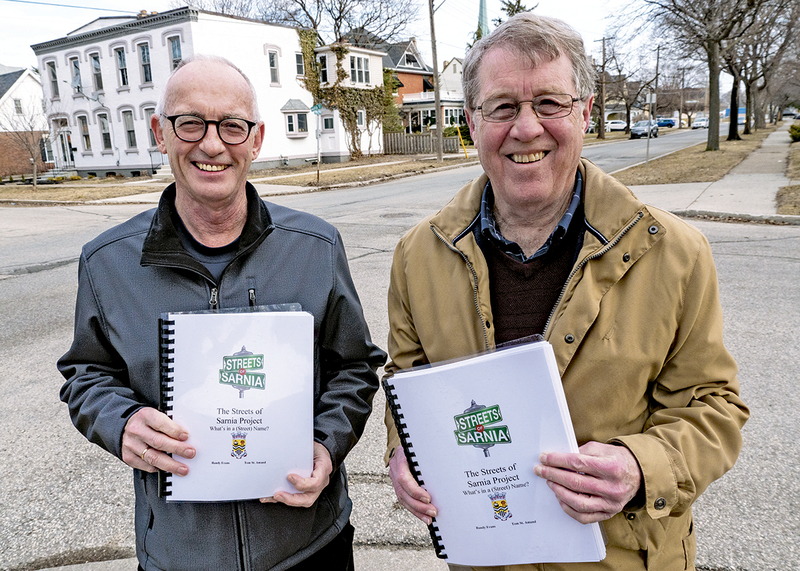 “The Sarnia Street Project: A History of Sarnia’s Street Names from 1836 – 2019,” is being printed at cost, for anyone who wants one, as of April 1. The spiral-bound book is available for $6.30 at the customer service desk in the Finance Department, on City Hall’s main floor.